Occupying the smallest bedroom was a twin-sized bed covered in creamy white linen lined with antique lace. 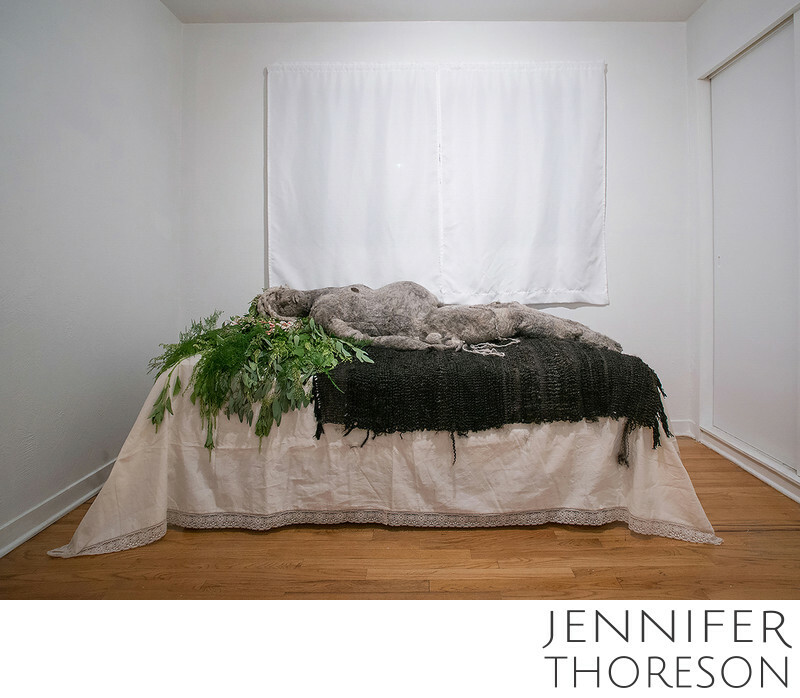 On the bed lay a sculpture of a pregnant woman fabricated entirely from grey churro wool. To create her, I re-purposed the two wool fleeces you see on the heads of the subjects in the photograph Soulmates. I cleaned the wool of lanolin and detritus by soaking it in several warm water baths. I dried the wool, combed, and carded it, creating a soft-bodied wool roving. I then slowly built up the body of the woman, using a wet felting technique for larger masses, and needle felting technique for detail areas. She is lying on a black woven blanket made from black wool yarn and human hair, which is re-purposed from the garment you see in the photograph Hair Cloak. I cut the cloak apart and re-assembled it, creating a rectangular shape for a bed covering.